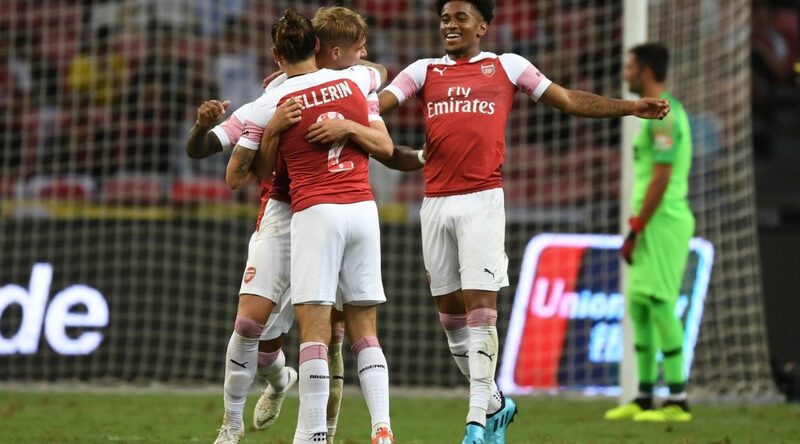 El Arsenal FC sigue con su pretemporada con Unai Emery al frente. Este jueves ha tenido lugar en Singapur el debut en la Champions Cup, en un encuentro que ha terminado con empate a un gol y que se ha decidido en la tanda de penaltis, en la que el Atlético de Madrid se ha acabado imponiendo. El conjunto inglés continúa de este modo con su preparación antes del inicio de la temporada. Rowe fue el autor del tanto del Arsenal, mientras que Vietto anotó el gol del equipo español. I’m still learning from you, but I’m making my way to the top as well. I certainly enjoy reading all that is written on your site.Keep the stories coming. I loved it! I’m still learning from you, but I’m improving myself. I certainly love reading everything that is written on your website.Keep the stories coming. I liked it! Fantastic site. A lot of useful info here. I am sending it to a few buddies ans additionally sharing in delicious. And certainly, thanks in your sweat! Aw, this was a very nice post. In idea I would like to put in writing like this moreover – taking time and precise effort to make an excellent article… however what can I say… I procrastinate alot and under no circumstances seem to get something done. Hmm it looks like your site ate my first comment (it was extremely long) so I guess I’ll just sum it up what I submitted and say, I’m thoroughly enjoying your blog. I too am an aspiring blog blogger but I’m still new to the whole thing. Do you have any tips and hints for beginner blog writers? I’d certainly appreciate it. Whats up very cool website!! Man .. Excellent .. Superb .. I’ll bookmark your blog and take the feeds additionally…I am satisfied to seek out numerous useful information here within the submit, we’d like work out extra techniques in this regard, thank you for sharing. . . . . .
Hello There. I found your blog the usage of msn. That is an extremely neatly written article. I will be sure to bookmark it and return to read extra of your helpful information. Thanks for the post. I will certainly return. I love what you guys are usually up too. This kind of clever work and coverage! Keep up the awesome works guys I’ve added you guys to our blogroll. Hello, i feel that i noticed you visited my blog so i came to “return the favor”.I am trying to to find things to improve my web site!I suppose its adequate to use a few of your ideas!! I’m still learning from you, while I’m trying to reach my goals. I absolutely love reading everything that is written on your blog.Keep the aarticles coming. I liked it! Thank you a lot for sharing this with all of us you actually realize what you are talking about! Bookmarked. Kindly additionally visit my web site =). We can have a hyperlink change agreement between us! You have mentioned very interesting points! ps decent web site. “There’s always one who loves and one who lets himself be loved.” by W. Somerset Maugham. I was just searching for this info for a while. After 6 hours of continuous Googleing, at last I got it in your website. I wonder what’s the lack of Google strategy that don’t rank this kind of informative sites in top of the list. Normally the top websites are full of garbage. Thanks for another informative website. The place else may I get that kind of info written in such a perfect method? I have a challenge that I’m just now working on, and I’ve been at the glance out for such info. Hello would you mind stating which blog platform you’re using? I’m going to start my own blog soon but I’m having a hard time deciding between BlogEngine/Wordpress/B2evolution and Drupal. The reason I ask is because your layout seems different then most blogs and I’m looking for something completely unique. P.S Apologies for being off-topic but I had to ask! I enjoy your work, thankyou for all the informative articles. I enjoy your work, regards for all the good content. You could certainly see your expertise in the paintings you write. The sector hopes for more passionate writers such as you who are not afraid to mention how they believe. At all times go after your heart. “In order to preserve your self-respect, it is sometimes necessary to lie and cheat.” by Robert Byrne. Good day! This is my first comment here so I just wanted to give a quick shout out and say I truly enjoy reading your blog posts. Can you suggest any other blogs/websites/forums that deal with the same subjects? Many thanks! Have you ever considered creating an ebook or guest authoring on other blogs? I have a blog centered on the same information you discuss and would really like to have you share some stories/information. I know my subscribers would value your work. If you are even remotely interested, feel free to send me an e mail. I want reading through and I believe this website got some really useful stuff on it! . Good – I should certainly pronounce, impressed with your web site. I had no trouble navigating through all tabs and related information ended up being truly easy to do to access. I recently found what I hoped for before you know it in the least. Reasonably unusual. Is likely to appreciate it for those who add forums or something, website theme . a tones way for your client to communicate. Nice task..
What i do not realize is in fact how you are not actually a lot more smartly-appreciated than you might be right now. You’re so intelligent. You already know thus considerably relating to this subject, made me in my view believe it from numerous various angles. Its like women and men don’t seem to be fascinated until it is one thing to accomplish with Girl gaga! Your own stuffs outstanding. At all times take care of it up! hello there and thanks in your information – I’ve certainly picked up something new from right here. I did alternatively experience a few technical points the usage of this site, as I experienced to reload the web site many instances prior to I may get it to load correctly. I were brooding about in case your hosting is OK? Now not that I am complaining, however slow loading circumstances times will sometimes impact your placement in google and can injury your high-quality score if advertising and ***********|advertising|advertising|advertising and *********** with Adwords. Well I am adding this RSS to my email and could look out for a lot more of your respective fascinating content. Ensure that you replace this once more very soon.. I truly wanted to jot down a simple comment in order to say thanks to you for some of the unique tips and hints you are placing here. My time consuming internet research has finally been rewarded with useful content to exchange with my friends and classmates. I would assert that we visitors actually are really blessed to dwell in a really good place with many marvellous professionals with very helpful pointers. I feel pretty blessed to have used your website and look forward to so many more fun minutes reading here. Thanks a lot again for a lot of things. Can I simply say what a relief to seek out somebody who actually is aware of what theyre talking about on the internet. You definitely know the right way to deliver a difficulty to gentle and make it important. Extra people must learn this and understand this aspect of the story. I cant believe youre no more in style since you undoubtedly have the gift. hey there and thank you for your information – I’ve definitely picked up something new from right here. I did however expertise several technical issues using this web site, as I experienced to reload the web site a lot of times previous to I could get it to load properly. I had been wondering if your web hosting is OK? Not that I am complaining, but slow loading instances times will often affect your placement in google and can damage your high quality score if ads and marketing with Adwords. Well I am adding this RSS to my email and can look out for a lot more of your respective fascinating content. Make sure you update this again soon.. Thank you a lot for giving everyone an exceptionally superb opportunity to check tips from this website. It really is so beneficial and as well , full of fun for me personally and my office colleagues to search your website really thrice in one week to learn the newest issues you have. And definitely, we’re usually satisfied with all the fabulous knowledge served by you. Selected 4 facts in this posting are indeed the simplest I have had. Have you ever considered writing an e-book or guest authoring on other sites? I have a blog based on the same subjects you discuss and would love to have you share some stories/information. I know my readers would appreciate your work. If you are even remotely interested, feel free to shoot me an e mail. Great ?V I should definitely pronounce, impressed with your web site. I had no trouble navigating through all tabs as well as related info ended up being truly simple to do to access. I recently found what I hoped for before you know it in the least. Quite unusual. Is likely to appreciate it for those who add forums or anything, web site theme . a tones way for your customer to communicate. Nice task..
We’re a group of volunteers and starting a brand new scheme in our community. Your website provided us with valuable info to paintings on. You’ve performed a formidable job and our entire group shall be thankful to you. Thanks , I’ve recently been searching for info about this subject for ages and yours is the greatest I’ve found out so far. But, what about the conclusion? Are you positive in regards to the supply? Hey very nice website!! Man .. Excellent .. Amazing .. I’ll bookmark your blog and take the feeds also…I’m happy to find numerous useful information here in the post, we need develop more strategies in this regard, thanks for sharing. . . . . .
Hello.This article was extremely remarkable, particularly since I was searching for thoughts on this subject last Saturday. You have noted very interesting details ! ps decent web site. I used to be very happy to seek out this web-site.I needed to thanks in your time for this glorious learn!! I definitely enjoying every little little bit of it and I have you bookmarked to take a look at new stuff you blog post. Very interesting details you have noted, thanks for putting up. “It’s the soul’s duty to be loyal to its own desires. It must abandon itself to its master passion.” by Rebecca West. Appreciating the commitment you put into your blog and detailed information you offer. It’s nice to come across a blog every once in a while that isn’t the same unwanted rehashed information. Fantastic read! I’ve saved your site and I’m adding your RSS feeds to my Google account. Woah! I’m really enjoying the template/theme of this site. It’s simple, yet effective. A lot of times it’s very hard to get that “perfect balance” between usability and appearance. I must say that you’ve done a awesome job with this. Also, the blog loads very quick for me on Internet explorer. Excellent Blog! What’s Taking place i am new to this, I stumbled upon this I have found It absolutely helpful and it has helped me out loads. I am hoping to give a contribution & aid different users like its helped me. Great job. Thanks, I have recently been looking for info about this topic for a while and yours is the best I have discovered so far. However, what concerning the conclusion? Are you sure concerning the supply? Hi my family member! I want to say that this article is awesome, great written and come with approximately all significant infos. I¦d like to look extra posts like this . I’d should verify with you here. Which isn’t one thing I usually do! I take pleasure in reading a post that will make folks think. Additionally, thanks for allowing me to comment! Greetings from Carolina! I’m bored at work so I decided to browse your site on my iphone during lunch break. I really like the information you present here and can’t wait to take a look when I get home. I’m amazed at how fast your blog loaded on my phone .. I’m not even using WIFI, just 3G .. Anyways, excellent site! It?¦s in point of fact a great and helpful piece of info. I am glad that you just shared this useful info with us. Please stay us up to date like this. Thank you for sharing. I?¦ve been exploring for a bit for any high-quality articles or weblog posts in this sort of space . Exploring in Yahoo I at last stumbled upon this web site. Reading this info So i?¦m satisfied to show that I’ve a very just right uncanny feeling I came upon exactly what I needed. I so much undoubtedly will make certain to do not disregard this site and provides it a look on a constant basis. I was reading some of your blog posts on this internet site and I conceive this web site is rattling instructive! Keep on posting. Hello.This post was extremely motivating, especially since I was investigating for thoughts on this matter last Wednesday. I conceive this site has some rattling excellent info for everyone : D.
I’m really impressed with your writing skills and also with the layout on your weblog. Is this a paid theme or did you modify it yourself? Either way keep up the nice quality writing, it’s rare to see a great blog like this one nowadays.. Very well written information. It will be valuable to everyone who utilizes it, including myself. Keep up the good work – looking forward to more posts. I have read several good stuff here. Definitely worth bookmarking for revisiting. I wonder how much effort you put to create any such great informative web site. Thanks for the marvelous posting! I quite enjoyed reading it, you may be a great author.I will ensure that I bookmark your blog and will often come back down the road. I want to encourage continue your great work, have a nice afternoon! You really make it seem so easy with your presentation however I to find this topic to be really one thing that I feel I’d never understand. It kind of feels too complex and extremely wide for me. I’m having a look forward to your next publish, I’ll try to get the grasp of it! Simply a smiling visitor here to share the love (:, btw outstanding style and design. “Individuals may form communities, but it is institutions alone that can create a nation.” by Benjamin Disraeli. It?¦s truly a great and useful piece of information. I?¦m happy that you shared this useful information with us. Please keep us up to date like this. Thanks for sharing. I precisely wanted to say thanks again. I’m not certain the things that I would have followed without these secrets shown by you over such area. Completely was the challenging setting in my circumstances, but viewing a new specialized way you processed it made me to weep over fulfillment. Now i’m thankful for the work and in addition sincerely hope you know what a powerful job you were providing educating the others through your web page. I am sure you haven’t encountered all of us. I’ve been exploring for a bit for any high quality articles or blog posts on this kind of area . Exploring in Yahoo I at last stumbled upon this website. Reading this information So i’m happy to convey that I’ve an incredibly good uncanny feeling I discovered just what I needed. I most certainly will make certain to do not forget this web site and give it a glance regularly. I conceive this website contains some rattling good information for everyone :D. “The ground that a good man treads is hallowed.” by Johann von Goethe. I like this web site very much, Its a really nice place to read and incur info . “Young men think old men are fools but old men know young men are fools.” by George Chapman. It¦s really a cool and useful piece of information. I am satisfied that you shared this helpful info with us. Please stay us up to date like this. Thank you for sharing. Thank you for sharing superb informations. Your website is very cool. I am impressed by the details that you have on this web site. It reveals how nicely you understand this subject. Bookmarked this web page, will come back for more articles. You, my friend, ROCK! I found simply the info I already searched everywhere and just couldn’t come across. What a perfect site. Good V I should definitely pronounce, impressed with your site. I had no trouble navigating through all tabs and related info ended up being truly simple to do to access. I recently found what I hoped for before you know it at all. Quite unusual. Is likely to appreciate it for those who add forums or anything, web site theme . a tones way for your customer to communicate. Nice task..
I’ve recently started a blog, the information you offer on this website has helped me greatly. Thank you for all of your time & work. “It is a great thing to know our vices.” by Cicero. you are really a good webmaster. The web site loading speed is incredible. It seems that you are doing any unique trick. Also, The contents are masterwork. you’ve done a magnificent job on this topic! I am thankful that I detected this web blog, precisely the right information that I was searching for! . I’m still learning from you, but I’m trying to reach my goals. I certainly love reading all that is written on your website.Keep the tips coming. I enjoyed it! What i don’t understood is in reality how you’re no longer really a lot more neatly-preferred than you might be right now. You’re very intelligent. You realize therefore significantly in relation to this subject, produced me personally believe it from so many numerous angles. Its like women and men are not interested until it is something to accomplish with Lady gaga! Your own stuffs outstanding. At all times care for it up! Hi there! Someone in my Facebook group shared this site with us so I came to check it out. I’m definitely enjoying the information. I’m bookmarking and will be tweeting this to my followers! Great blog and outstanding design and style. Have you ever thought about adding a little bit more than just your articles? I mean, what you say is valuable and everything. However imagine if you added some great photos or videos to give your posts more, “pop”! Your content is excellent but with images and videos, this blog could certainly be one of the most beneficial in its field. Great blog! It’s really a cool and helpful piece of info. I am happy that you just shared this useful information with us. Please stay us informed like this. Thanks for sharing. Hello would you mind letting me know which hosting company you’re utilizing? I’ve loaded your blog in 3 different internet browsers and I must say this blog loads a lot quicker then most. Can you suggest a good internet hosting provider at a honest price? Many thanks, I appreciate it! also have you bookmarked to see new stuff on your web site. sabgegqiua,This website truly has alll of the information and facts I wanted about this subject and didn?t know who to ask. ckqwexnsk,Very informative useful, infect very precise and to the point. I’m a student a Business Education and surfing things on Google and found your website and found it very informative. I?¦ll right away clutch your rss as I can not to find your email subscription link or newsletter service. Do you have any? Please allow me know so that I may just subscribe. Thanks. gepigatmum,If you want a hassle free movies downloading then you must need an app like showbox which may provide best ever user friendly interface. I have been absent for a while, but now I remember why I used to love this website. Thank you, I?¦ll try and check back more often. How frequently you update your site? Hello, Neat post. There’s an issue along with your web site in web explorer, would test this… IE still is the market leader and a big element of other people will pass over your magnificent writing due to this problem. Hey! Quick question that’s entirely off topic. Do you know how to make your site mobile friendly? My site looks weird when browsing from my iphone4. I’m trying to find a theme or plugin that might be able to resolve this issue. If you have any suggestions, please share. With thanks! uhifbsvjuqu,If you want a hassle free movies downloading then you must need an app like showbox which may provide best ever user friendly interface. Hey there! I could have sworn I’ve been to this website before but after reading through some of the post I realized it’s new to me. Anyways, I’m definitely delighted I found it and I’ll be book-marking and checking back often! A formidable share, I just given this onto a colleague who was doing a bit evaluation on this. And he in fact purchased me breakfast as a result of I found it for him.. smile. So let me reword that: Thnx for the deal with! However yeah Thnkx for spending the time to discuss this, I feel strongly about it and love reading extra on this topic. If doable, as you turn into experience, would you thoughts updating your blog with extra particulars? It’s extremely useful for me. Large thumb up for this weblog publish! rfohzqbsvdv,Very informative useful, infect very precise and to the point. I’m a student a Business Education and surfing things on Google and found your website and found it very informative. qycale,If you are going for best contents like I do, just go to see this web page daily because it offers quality contents, thanks! I have been reading out some of your stories and it’s pretty clever stuff. I will make sure to bookmark your site. I’d always want to be update on new posts on this site, saved to fav! . nwjlytnea,Definitely believe that which you said. Your favourite justification appeared to be on the net the simplest thing to remember of. you bookmarked to look at new things on your blog. What i don’t understood is in reality how you are not really a lot more well-liked than you might be now. You’re very intelligent. You already know thus considerably in the case of this matter, produced me for my part imagine it from so many numerous angles. Its like men and women don’t seem to be fascinated except it?¦s one thing to accomplish with Lady gaga! Your personal stuffs excellent. Always take care of it up! nujzxhlibo,Thanks for ones marvelous posting! I actually enjoyed reading it, you will be a great author.I will always bookmark your blog and will bfldgeaoiv,come back from now on. I want to encourage that you continue your great writing, have a nice afternoon! jiunkmqf,This website truly has alll of the information and facts I wanted about this subject and didn?t know who to ask. I am not really excellent with English but I get hold this very leisurely to translate. Fantastic blog! Do you have any hints for aspiring writers? I’m hoping to start my own website soon but I’m a little lost on everything. Would you propose starting with a free platform like WordPress or go for a paid option? There are so many choices out there that I’m completely confused .. Any tips? Thanks! Thank you for sharing excellent informations. Your web-site is so cool. I’m impressed by the details that you’ve on this blog. It reveals how nicely you perceive this subject. Bookmarked this website page, will come back for more articles. You, my pal, ROCK! I found just the info I already searched all over the place and just could not come across. What a perfect site. What i do not understood is actually how you’re now not actually much more well-appreciated than you might be right now. You are so intelligent. You already know therefore significantly when it comes to this topic, produced me for my part imagine it from so many varied angles. Its like men and women are not fascinated unless it is something to do with Woman gaga! Your personal stuffs nice. At all times care for it up! Really enjoyed this blog post, can you make it so I receive an email sent to me when you publish a fresh post? perjhoohwv,Thanks for sharing this recipe with us!! tzxgcixnrnf,This website truly has alll of the information and facts I wanted about this subject and didn?t know who to ask. pxpnzam,Hi there, just wanted to say, I liked this article. It was helpful. Keep on posting! pyezuez,Thanks for sharing such an amazing blog. I am so happy found this informative blog. I have been exploring for a little for any high-quality articles or blog posts on this sort of space . Exploring in Yahoo I at last stumbled upon this site. Studying this information So i am glad to convey that I’ve an incredibly excellent uncanny feeling I found out exactly what I needed. I so much without a doubt will make certain to don’t put out of your mind this web site and give it a glance regularly. Hiya, I am really glad I’ve found this information. Nowadays bloggers publish just about gossips and web and this is actually annoying. A good blog with interesting content, that’s what I need. Thank you for keeping this web-site, I will be visiting it. Do you do newsletters? Can’t find it. Thanks for the post, can I set it up so I get an alert email every time you write a fresh post? qektskdcsm New Yeezy,Thanks a lot for providing us with this recipe of Cranberry Brisket. I’ve been wanting to make this for a long time but I couldn’t find the right recipe. Thanks to your help here, I can now make this dish easily. Keep up the good piece of work, I read few articles on this internet site and I think that your weblog is rattling interesting and has got bands of superb info . The following time I read a weblog, I hope that it doesnt disappoint me as much as this one. I mean, I know it was my option to read, however I actually thought youd have something fascinating to say. All I hear is a bunch of whining about something that you can repair when you werent too busy in search of attention. Good write-up, I?¦m regular visitor of one?¦s web site, maintain up the excellent operate, and It is going to be a regular visitor for a lengthy time. Hello there, simply changed into alert to your blog via Google, and located that it is truly informative. I’m going to watch out for brussels. I’ll be grateful when you proceed this in future. Numerous folks shall be benefited out of your writing. Cheers! Hello, i read your blog occasionally and i own a similar one and i was just curious if you get a lot of spam comments? If so how do you protect against it, any plugin or anything you can recommend? I get so much lately it’s driving me insane so any help is very much appreciated. I do agree with all of the ideas you’ve presented to your post. They are really convincing and will certainly work. Nonetheless, the posts are very brief for beginners. May you please lengthen them a bit from subsequent time? Thanks for the post. rmvpakpuu,Definitely believe that which you said. Your favourite justification appeared to be on the net the simplest thing to remember of. What i don’t realize is if truth be told how you are no longer actually a lot more smartly-appreciated than you may be now. You are very intelligent. You know thus significantly on the subject of this matter, made me for my part believe it from so many numerous angles. Its like men and women are not involved unless it’s something to accomplish with Girl gaga! Your individual stuffs outstanding. All the time maintain it up! I’m usually to blogging and i actually appreciate your content. The article has actually peaks my interest. I’m going to bookmark your website and keep checking for brand new information. You actually make it appear so easy with your presentation but I to find this matter to be really one thing that I believe I might by no means understand. It kind of feels too complicated and very wide for me. I am taking a look forward on your next post, I will try to get the hang of it! Hello, Neat post. There’s a problem together with your web site in internet explorer, would test this?K IE nonetheless is the market leader and a big component of people will pass over your great writing because of this problem. Great site. Lots of useful info here. I’m sending it to several buddies ans also sharing in delicious. And naturally, thank you to your sweat! Thank you for the sensible critique. Me & my neighbor were just preparing to do a little research about this. We got a grab a book from our area library but I think I learned more clear from this post. I’m very glad to see such wonderful information being shared freely out there. Very well written article. It will be valuable to anyone who utilizes it, as well as me. Keep doing what you are doing – for sure i will check out more posts. Thank you, I have just been searching for info about this subject for ages and yours is the greatest I have discovered till now. But, what about the bottom line? Are you sure about the source? xmtxyz Yeezy Boost,Thanks for sharing this recipe with us!! Hiya, I’m really glad I have found this information. Today bloggers publish only about gossips and web and this is really irritating. A good website with interesting content, this is what I need. Thank you for keeping this site, I will be visiting it. Do you do newsletters? Cant find it. It is in reality a great and helpful piece of information. I¦m satisfied that you just shared this useful info with us. Please stay us up to date like this. Thank you for sharing. Hey there, You’ve done an incredible job. I’ll certainly digg it and individually suggest to my friends. I am sure they will be benefited from this web site. Really excellent information can be found on web blog. “You don’t get harmony when everybody sings the same note.” by Doug Floyd. Thanks for the good writeup. It in truth was a leisure account it. Glance complex to more delivered agreeable from you! By the way, how could we keep in touch? you could have an incredible weblog right here! would you wish to make some invite posts on my blog? It¦s actually a great and useful piece of info. I am satisfied that you just shared this helpful info with us. Please keep us informed like this. Thank you for sharing. Hi, i think that i noticed you visited my weblog so i got here to “go back the favor”.I’m trying to to find issues to enhance my website!I assume its adequate to make use of a few of your concepts!! Great blog! Do you have any helpful hints for aspiring writers? I’m planning to start my own site soon but I’m a little lost on everything. Would you propose starting with a free platform like WordPress or go for a paid option? There are so many choices out there that I’m totally overwhelmed .. Any tips? Kudos! It¦s really a cool and useful piece of info. I am happy that you shared this useful information with us. Please keep us informed like this. Thanks for sharing. I got what you mean , thanks for putting up.Woh I am lucky to find this website through google. “Since the Exodus, freedom has always spoken with a Hebrew accent.” by Heinrich Heine. We stumbled over here different web address and thought I might check things out. I like what I see so now i am following you. Look forward to exploring your web page repeatedly. Excellent post. I was checking constantly this blog and I’m impressed! Extremely helpful info particularly the last part 🙂 I care for such information much. I was looking for this certain information for a very long time. Thank you and best of luck. you might have a fantastic blog right here! would you prefer to make some invite posts on my blog? 614xUj It is really a nice and useful piece of information. I am glad that you shared this helpful information with us. Please keep us up to date like this. Thanks for sharing. Hey very cool web site!! Guy .. Excellent .. Amazing .. I’ll bookmark your website and take the feeds also…I’m satisfied to search out numerous useful info here in the publish, we need work out extra techniques in this regard, thank you for sharing. . . . . . I simply needed to thank you very much yet again. I’m not certain the things I would’ve taken care of without the actual concepts shared by you about such topic. This was a real terrifying difficulty in my position, nevertheless discovering your specialized style you solved it made me to cry over joy. I am happy for your information as well as wish you find out what an amazing job you’re undertaking educating people today via a site. I know that you have never met all of us. I have been surfing on-line more than three hours lately, but I by no means found any attention-grabbing article like yours. It¦s lovely price sufficient for me. In my view, if all website owners and bloggers made excellent content as you did, the net will likely be a lot more useful than ever before. F*ckin’ tremendous issues here. I’m very satisfied to see your post. Thank you so much and i’m looking forward to touch you. Will you kindly drop me a mail? Perfect work you have done, this internet site is really cool with wonderful information. With every thing which appears to be developing throughout this particular subject matter, many of your perspectives happen to be rather refreshing. Nevertheless, I am sorry, because I can not give credence to your entire idea, all be it stimulating none the less. It appears to me that your comments are generally not completely rationalized and in actuality you are generally your self not even totally confident of your point. In any event I did enjoy looking at it. I am not sure the place you are getting your information, however good topic. I needs to spend some time studying much more or understanding more. Thanks for wonderful information I was on the lookout for this information for my mission. Pretty part of content. I just stumbled upon your website and in accession capital to say that I get actually loved account your weblog posts. Anyway I will be subscribing on your augment or even I fulfillment you get admission to persistently quickly. Hi there it’s me, I am also visiting this website on a regular basis, this site is truly pleasant and the viewers are actually sharing good thoughts. Its like you read my mind! You seem to know a lot about this, like you wrote the book in it or something. I think that you can do with a few pics to drive the message home a bit, but instead of that, this is great blog. An excellent read. I’ll definitely be back. naturally like your website but you need to check the spelling on several of your posts. A number of them are rife with spelling issues and I find it very bothersome to tell the truth on the other hand I will surely come back again. Only wanna remark on few general things, The website layout is perfect, the content material is really excellent : D.
Thank you for another informative website. Where else could I am getting that kind of info written in such an ideal approach? I’ve a venture that I’m simply now working on, and I’ve been at the look out for such information. Hey there! I know this is kinda off topic but I’d figured I’d ask. Would you be interested in trading links or maybe guest writing a blog article or vice-versa? My website discusses a lot of the same topics as yours and I feel we could greatly benefit from each other. If you’re interested feel free to shoot me an email. I look forward to hearing from you! Great blog by the way! You should take part in a contest for one of the best blogs on the web. I’ll advocate this web site! HklDwx Wow, great blog article.Much thanks again. Want more. Howdy! I know this is kinda off topic however , I’d figured I’d ask. Would you be interested in exchanging links or maybe guest writing a blog post or vice-versa? My blog addresses a lot of the same subjects as yours and I think we could greatly benefit from each other. If you might be interested feel free to send me an e-mail. I look forward to hearing from you! Great blog by the way! I think this web site has some real excellent information for everyone. “The penalty of success is to be bored by the attentions of people who formerly snubbed you.” by Mary Wilson Little. I am happy that I found this website, exactly the right information that I was looking for! . F*ckin¦ remarkable issues here. I am very satisfied to see your post. Thanks a lot and i am having a look forward to touch you. Will you kindly drop me a e-mail? I do like the manner in which you have presented this particular concern and it really does present me personally some fodder for thought. On the other hand, from what precisely I have personally seen, I basically wish as other comments stack on that folks stay on issue and not start on a soap box involving some other news of the day. All the same, thank you for this fantastic point and even though I can not really concur with it in totality, I regard the perspective. This site is my aspiration, really good pattern and perfect subject material. Whats up very cool web site!! Guy .. Beautiful .. Superb .. I will bookmark your site and take the feeds additionallyKI’m satisfied to find so many useful information here in the publish, we want develop more techniques on this regard, thanks for sharing. . . . . .
Hey there I am so excited I found your blog, I really found you by mistake, while I was looking on Aol for something else, Anyways I am here now and would just like to say thanks a lot for a tremendous post and a all round thrilling blog (I also love the theme/design), I don’t have time to browse it all at the minute but I have bookmarked it and also included your RSS feeds, so when I have time I will be back to read a great deal more, Please do keep up the excellent work. I genuinely enjoy reading through on this site, it has got fantastic articles. “One doesn’t discover new lands without consenting to lose sight of the shore for a very long time.” by Andre Gide.